One of the pleasures of this reviewing lark is that once in a while something hitherto unheard of will land in your inbox that simply takes your breath away. This is as you might imagine, a fairly rare occurrence, for although during the course of a year the reviewer may receive a handful of seriously good CDs amongst the piles of average and worse, to receive something astounding is a rarefied pleasure indeed. Such a thing is Metamorphic Rock whose irreducible complexity, to borrow one of the song titles is of such a seriously magical content I just can’t put it down. This band is filling mega stadiums in a parallel universe where Simon Cowell is on trial for crimes against art. Formed by composer and guitar player Denis Rea, Moraine have so far released just one studio album, Manifest Destiny in 2009, and Metamorphic Rock is a document of their appearance at the 2010 Nearfest in the USA in front of a small but appreciative crowd, most of whom no doubt know how lucky they were to have witnessed such a wonderful ensemble in action. Covering the many strata of styles that results in an easily identifiable cogent whole is no mean feat but Dennis Rea – guitars, James DeJoie – sax, flute, percussion, Alicia DeJoie – violin, Kevin Millard – eight string bass, and Stephen Cavit – drums make it sound easy. Dennis Rea, guitar player extraordinaire, covers all bases from Page-like riffage to Fripp math excursions, along the way taking on Chinese scales and Far Eastern imagery, amongst a whole gamut of other influences. Until last year I had not heard of this man, and I regret that a lot! He is also a member of Moonjune heavy jazz-fusion combo Iron Kim Style and has recently released a gorgeous solo album, but they are stories for another page. The compositional credits are dominated by Dennis, with contributions from James and Alicia and Kevin, with one group composition, and another written by since departed cellist Ruth Davidson who appeared on Manifest Destiny. Indeed, since that album the cello contributions have been replaced by James’ sax and flute. After the almost Zeppelin-esque power of James’ opener Irreducible Complexity, an early highpoint is the three part track Disillusioned Avatar/Dub Interlude/Ephebus Amoebus. The first part is composed by Alicia and her violin takes a plaintive lead melody with Dennis’ subtle guitar sounding like an elongated sigh as the tune sways along, conveying the melancholy of a deity disappointed with the results of man’s “achievements”. When I read the word “Dub” in a rock context, the aural results are often cliché-ridden and cringeworthy, not this time though as the short unobtrusive section soon leads into Kevin’s jazz-infused Ephebus Amoebus. As a non-muso I often wonder how drummers write songs, but this guy has come up with a mini jazz symphony over which Dennis goes through all kinds of gear changes including an avant cacophony. Marvellous! Dennis’ Disoriental Suite follows with a marked change of style with much Eastern percussion and is lifted from his solo album Views From Chicheng Precipice and manages to mix traditional Chinese music and Dennis’ take on that sound with a sort of alt-blues with absolutely no problems at all. This is a truly beautiful piece of music my friends, and one not to be missed, and the band’s easy intuitive style is one that should, if there was any justice, make Moraine a household name, at least amongst the prog community. Here I should mention the rhythm section which as is necessary cope with all the style changes and Eastern time signatures with a casual ease that should frighten off lesser mortals. Stephen replaced the original drummer and so had to learn most of this from scratch, which shows how good he must be. Some of the other things I can hear in this are chamber prog, Zappa, jazz-fusion, avant garde sound painting and hoedown….that last one was possibly a joke. Unusually for a live album there are previously unreleased compositions on here as well as a good few tracks from Manifest Destiny, and the aforementioned lift from Dennis’ solo album. This was presumably to accommodate the new line up where the cello is replaced by the sax & flute, and the tracks from Manifest Destiny do sound fuller in this new context. The Okanogan Lobe has some nice squalling guitar and sax and violin and is a tremendous thing running amok until it ends with a melancholy air featuring some nice reverbed violin and a soaring solo from Dennis. Even when things get a bit out there, as on Uncle Tang’s Cabinet of Dr. Caligari for instance, the madness never takes over to the detriment of the arrangement, such is Dennis’ and the band’s compositional flair. Blues For A Bruised Planet does what is says on the tin, free of tired old 12-bar cliché too. Some nice trading of licks and interplay between the guitar and violin permeates Middlebräu and we reluctantly come to the end of a stunning musical tour-de-force…damn, just hit repeat! Hell, I’m beginning to sound sycophantic, but honestly, it’s not intended. 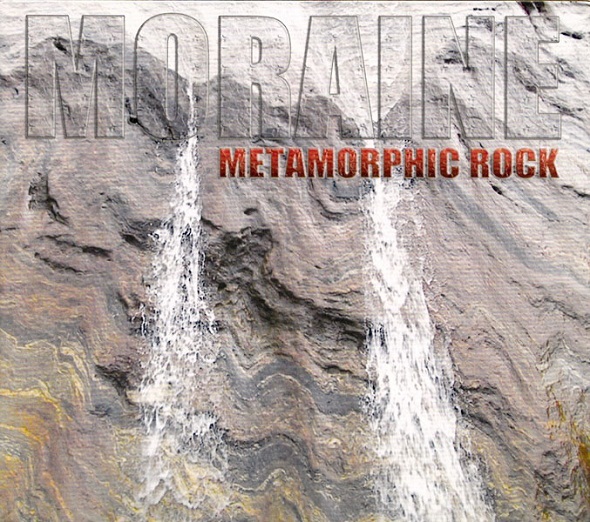 Metamorphic Rock is a timeless slab of an album and there is nothing at all terminal about this Moraine! Do yourself a favour, if you like good adventurous music, be it prog or any other genre, buy this seriously good CD, currently available from Moonjune Records at a bargain $12 (USA) or $14 (outside USA) including shipping. That, my good people, is a steal, treat yourself!